There’s no better way to learn than by working One-On-One with a true master. When you work PRIVATELY with Brad Michaels, you get a hand-crafted program, personal attention and access to 30-plus years of wisdom and experience. Based upon your interests, scheduling requirements and learning preferences, Brad will work with you to design a fully personalized program that offers the best possible results for your specific objectives. 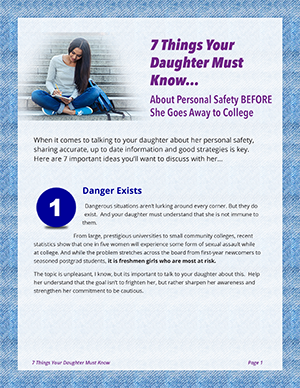 Whether for you, your daughter or any other member of your family, the following topics are the most crucial and will provide an essential foundation for your safety. You may choose to focus on any or all of these areas. If you’d like something other than what is listed, Brad will be happy to discuss your particular interests and design whatever you need. For more information on this, click here to contact Brad Michaels.